Immaculate Lakefront Pine log-sided home built in 2008 on 2.06 acres. 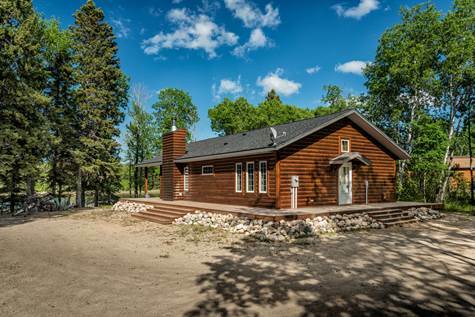 Just down the road from Poplar Ridge Golf Course and Onanole, this clean and fresh cottage, surrounded by 200ft of panoramic lake views, boasts an open-style concept with vaulted ceilings. The cottage features a beautiful stone fireplace, 3 ample bedrooms, 2 full baths, all stainless steel appliances, custom blinds, alarm system, and 3 season guest house with 2 additional outdoor sheds. All situated on a spacious yard ready to expand, this home is move-in ready. Enjoy this peaceful private setting with year-round access to everything the Parkland has to offer.